Microscope eyepieces often have several numbers and letters inscripted on them. 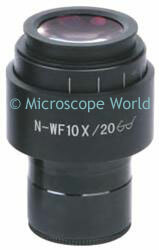 For example, you may have a microscope eyepiece that has KWH10x/20 written on it. K or C = compensating eyepiece. Some microscope objectives do not include correction for lateral chromatic aberration and in these cases, the compensating eyepiece completes this correction. WF = widefield eyepiece. This means more of the specimen can be viewed at a given time. H = high eyepoint eyepiece. The user's eyes do not have to be placed very close to the eyepiece lens during observation. This is especially helpful for those who wear eyeglasses. 20,22, etc. = This is the field number of the eyepiece. The higher the field number of the eyepiece that is used with a particular objective, the larger the field of view and the more of the specimen that can be seen through the microscope. The diameter of the field of view in millimeters is calculated by dividing the field number of the eyepiece by the magnification of the objective. So if you are using an eyepiece that says WF10x/20 and a 4x objective lens, your field of view would be 20/4 = 5mm. A larger field of view is often preferred by scientists.